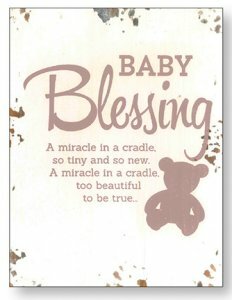 CATHOLIC GIFT SHOP LTD - Baby Blessing - Distressed Wood Plaque. Distressed wood effect plaque " Baby Blessing ". A Miracle in a Cradle. This wood effect plaque is free standing or can be hung.